First of all – congratulations! The world of solo travel may seem a bit scary at first, so well done for taking the leap! You are soon to find out that travelling on your own is one of the most incredible and rewarding experiences. Before that happens though, you might be feeling a bit unsure so I’ve put together a list of essential tips for first time solo female travellers. They are based on my personal experience as a digital nomad and solo traveller. I hope you ladies find them useful! Choose a destination that will be easy to travel around, that is generally considered safe and won’t be too much of a culture shock – Western Europe, for example. This one is a no brainer, but make sure to do your research before you go, this way you will know what to expect. Don’t just rely on travel guides though – browse online forums (Lonely Planet’s Thorn Tree Forum is one of the best ones out there), read travel blogs and follow relevant social media accounts. 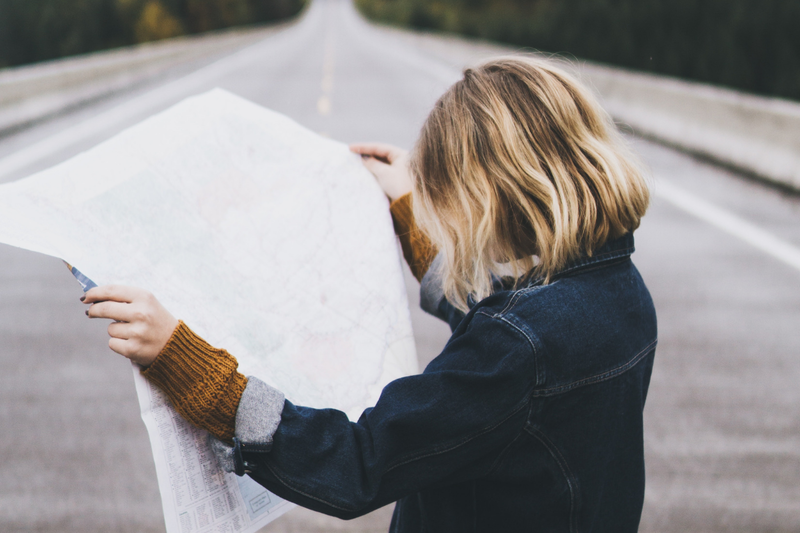 Study the map of the places you’re going to visit – this way you’ll have a good idea of where everything is before you set off on your trip. If you’re worried about getting lost, use your Google Maps app to save maps for offline access – this way you can track your location without wifi! Have an idea of what you want to do and see – you don’t have to plan your day to the hour, but having a rough itinerary will make you feel more confident and in control. Be sure to leave room for spontaneity! Don’t forget to do a research into living and travel costs so you can budget accordingly. For more hands-on tips, read my article on how to save for travelling long term. One of the biggest myths surrounding solo travel is that it’s expensive – it’s not, as long as you do it right. I wrote a detailed article about travelling on the cheap, have a read if money is something you’re worried about! Safety: you’re the one in charge! Always look confident, especially if you’re feeling the exact opposite – otherwise you will be an easy target for touts and scammers. Respect the local culture – not just by how you dress but by the way you act. Follow your instincts – if something doesn’t feel right, it’s probably because it isn’t! Before you book your accommodation, do some research into the area and check the reviews to avoid disappointment. Ask the hotel staff if they offer a pickup service, especially if you’re arriving after dark. Avoid arriving late at night or early in the morning when most places are closed. It’s best not to travel with a large sum of money but if you have no other choice, keep it in a money belt hidden under your clothes and put smaller notes in your wallet. Have a sense of what’s going on around you. Is someone following you? Have you suddenly made the wrong turn and found yourself in a shady street? Is the guy at the market ripping you off? Always pay attention to your surroundings. Travelling solo doesn’t have to be lonely! There are always plenty of opportunities to make new friends on your travels. The best place to start is your hotel – are there any other solo travelers there? Have a chat with them and who knows, maybe you’ll end up exploring the city together! How about joining a tour? And let’s not forget the local hubs like cafes and bars – these places are perfect for meeting the locals. You can also join online travel communities like Couchsurfing, Meetup, Internations or Facebook expat groups to see if they organise events in the area that you’re travelling to. You’ll be tempted to see and do as much as possible, after all, you don’t want to ‘miss out’. So you rush through the city, ticking off the main sites from your guide, you have a crappy sandwich for lunch or miss it altogether because you’re too busy ‘exploring’; by 9pm you’re ready to crash, exhausted and not quite sure what you actually saw as it’s all a confusing blur. This is NOT the way to travel! Travelling is about the experience. It’s much better to see less, but see it properly. Stroll around, enjoy your lunch, take in the foreign sights and smells, listen to the rhythm of the city, chat to the locals… in other words, travel mindfully. One of the best things about solo travel is that you can do everything in your own time, so there really is no need to rush! Travel guides are great but try not to rely on them too much as you’ll essentially end up recreating somebody else’s experience. Instead, create your own! Getting lost doesn’t have to be scary – it gives you the chance to create your own map, marked out by your experiences. Last but definitely not least, stay positive! Your attitude can really make or break your trip, and keeping a positive outlook will guarantee that no matter what happens, your first solo adventure will be a fun, unforgettable experience. After all, isn’t that the reason you wanted to travel in the first place? Are you a solo traveller? Do you have anything to add to the list? Let us know in the comments below!